When people look at the results of a system or a method they usually look at the profit/loss figure and the strike rate as a minimum. Most of the time they will look at the ROI percentage (that's the Return on Investment) and that's usually it when it comes to determining whether something that they've been investigating is worth following, modifying or abandoning altogether. But that shouldn't be the whole picture. I like to look at how 'lumpy' a system is before going ahead with it. By that I mean are there going to be any terrifying runs which seem to go on forever or is the trend, if one were to put it into a graph, smooth? As a general rule the smoother the profit curve the better, as this is what we want because it means that the profits will keep on coming in and we're not laying awake at nights wondering if our bank is going to bust. And this is the prime consideration for any punter: to protect one's bank. This is because, quite simply, without a bank we can't invest in any method or system. And this is where we need to look at what's called the Drawdown because when we know what the drawdown has been in the past we can make a good estimate on how many points our betting bank needs to be. And, furthermore, if we are in the middle of a losing run and we have seen the bank recover from a much larger drawdown in the past then it makes it easier to carry on. So, what is the drawdown? Let's look a little further. First of all, look at this Profit/Loss chart for something that I have been following for the past year. There's only one axis labelled (the vertical one) which gives the profit and loss in terms of points staked. The horizontal axis is, as expected, the history of this bank over about four hundred selections. That's a good little graph and it's going up nicely making about 80 points in a year, but it has periods of lulls and a few downturns here and there but, on the whole, it's going in the right direction and, if I am honest, I am pleased with this method that I am using. So let's look at the drawdown. What a drawdown is is quite simple and can be defined by a simple rule. The Drawdown is the fall between a previous highest high and today's value on the chart. So, if in our records we can see that our current profit/loss is standing at, say, +20 points since we started but sometime previously our profit/loss had once reached 30 points then our drawdown is currently at 10 points. Time to add some lines to that chart to illustrate this further. There are two sets of parallel lines on this chart; the first set are in red and the second set are in green. Look at the first red pair of parallel lines. The profit/loss line went to just over 20 points which became a Highest High (which replaced the previous Highest High which was at around +8pts). There would have been a small number of losing selections, as is expected when one betting odds against, a low priced winner which brought the profit/loss up again to nearly to the level of the Highest High, a loser or two, a very low priced winner, another low priced winner which would have taken the account up to almost the Highest High and then a losing run which kicked in for about fourteen runners with a small low priced winner in the middle of that sequence. Nothing unusual there at all, this is, after all, the nature of betting. 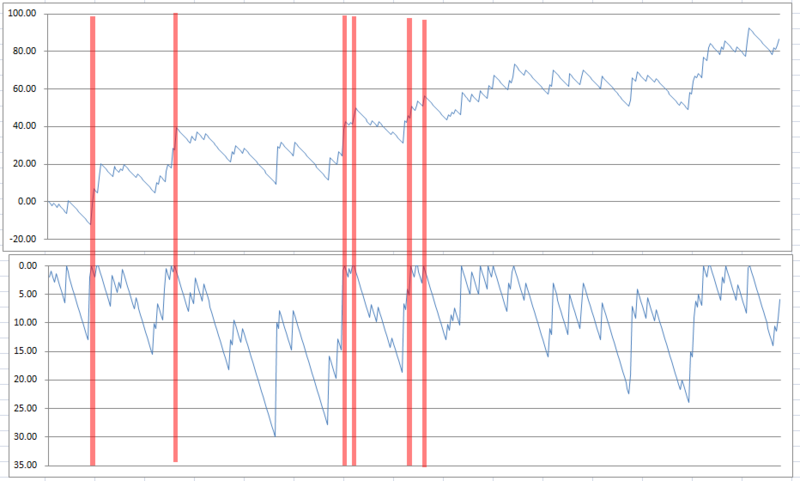 At the point of the bottom red line is the drawdown to date. That is the difference between the top red line and the bottom one. Until that point in time the drawdown had never been so big. Perhaps it's time to throw in a second definition and one that we will be working with. The Largest Drawdown is the biggest drawdown that has occured. On our chart we can see that the profit/loss has recovered from the red line and then rose, after a couple of winners, to around 30 points which would have then made the chart's new Highest High. Another good winner and we've hit the forty point level (which is where I have drawn the upper green line). Then a long run of losers with half a dozen winners in that period brings us to the bottom green line before fortunes turned and the profits recovered. Now, do note that that the distance between the two red lines is smaller than the distance between the two green lines which, therefore makes the gap between the two green lines the Largest Drawdown to date. For the record it's about thirty points deep. The Largest Drawdown value would be easy to find with another chart. This is the drawdown plotted for the initial profit/loss chart and it becomes easy to see that the largest drawdown is thirty points. If we wanted to see how the two charts are related then we can look at this image. I have drawn a few vertical lines so that you can see the various highs on the upper chart (the profit/loss chart) with the drawdown chart (the lower). I could have drawn dozens more vertical lines, seventeen to be exact, if I so wished but I only drew half a dozen to illustrate my point. If you look at the bottom chart, each time the line rises and hits zero then you can see that the profit/loss line on the top chart has reached a new high. Time for a new definition. This time this is one of my own making, so feel free to discard it if you wish. A Profit Point is where the Drawdown chart reaches zero. Profit Points are what it's all about as far as I am concerned. Each time we hit a new Profit Point the bank has reached a new Higher High and this is what we want: increasing profits. Anyway, this is an aside and it's time to get back to the drawdown discussion. In this example we can see that over the course of over 400 bets that the largest drawdown is 30 points. So when we're calculating what size bank we should have we can take it from here. Now, as far as I am concerned if we're at a drawdown of thirty points then there's nothing to stop a further fall of another thirty points. Immediately, we're looking at sixty points. But I would rather a little more of a cushion so I would round up that figure of thirty to, say, fifty and then double that to a hundred points. And that would be my minimum bank. Ideally, I would have more points, say 150 because, at the end of the day, I wish to sleep at nights. I have seen one other web site which gave another example of bank size calculation which, frankly, frightens me. In their example their largest drawdown was over 78 points and then they suggested then that a good bank size would be 100 points. If I were such a punter and I was burning through eighty percent of my bank then I wouldn't be comfortable at all. If I had a system which gave me a drawdown of 78 points then I would round that up to one hundred, double that to two hundred and then perhaps round it again to about 250 points. No less and certainly not to one hundred points. Rather than explain how to make a drawdown calculator it'll be easier to present one. There is an Excel sheet here called DrawdownCalculator.zip and all one has to do is to paste a column of results from your results sheet into Cell A8 downwards. All you have to ensure is that a losing bet has a value of -1, a winning bet at evens is 1.0, a winning 6/4 is 1.5 and so on. And then the sheet will take care of the rest. I hope that this article is useful and informative.